No biggie… we’re just giving away 5 x double VIP passes to the biggest music festival in the world, Coachella! * 2 x 4 nights’ three-star twin share accommodation. * Travel insurance for each prize winner and companion from 11 April 2019 to 17 April 2019 with Covermore or Covermore Youth insurance as per their policies. * Return airport transfers: Private group transfers for the Boost Juice VIP Prize Winners from LAX airport to the Accommodation and back again on the dates of the flights. * Return Coachella transfers from the accommodation to the Coachella festival locations on each day of the festival with Coachella shuttle pass. Prize must be taken to coincide with the Coachella Festival 2019 – Weekend 1 (12/04/19 – 14/04/19). prize is for or relates to Coachella Festival 2019 – Weekend 1 (12/04/19 to – 14/04/19) (the “Event”). winner is unwilling or unable to attend at the designated time for the Event, they forfeit the prize and the Promoter is not obliged to substitute the prize. * The VIP Tickets to Coachella Festival 2019 – Weekend 1 are subject to the event venue and ticket terms and conditions, including any applicable age restrictions. winner and/or his/her companion for any inappropriate behaviour, including but not limited to intoxication, whilst participating in any element of the prize. * Any resale of the Coachella tickets is prohibited and the prize is non-transferrable. * Travel itinerary will be determined by the Promoter in its absolute discretion. 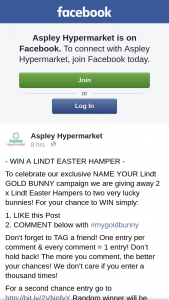 * Prize is subject to the standard terms and conditions of individual prize and service providers. * Flights must depart Australia on 11 April 2019 and return from LAX, Los Angeles to Australia on 15 April 2019. * The winner and his/her travel companion must depart from and return to the same departure point and travel together a major city in Australia). 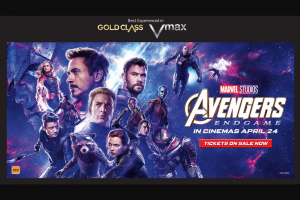 * Subject to the terms and conditions of the participating prize provider(s), if for any reason the winner does not, once the prize has been booked, take the prize (or an element of the prize) at the time stipulated, then the prize (or that element of the prize) will be forfeited and will not be redeemable for cash or a substitute prize. * Itinerary will be determined by the Promoter in its absolute discretion. * Frequent flyer points will not be awarded and do not form part of the prize. * Spending money, meals, taxes (excluding airline and airport taxes), insurance, passports, visas (if applicable), vaccinations, transport to and from departure point, transfers, items of a personal nature, in-room charges and all other ancillary costs, unless otherwise specified in the prize description, are not included. * The winner may be required to present their credit card at check in. * The winner and their travel companion must be the holders of valid passports with at least 6 months validity left at the time of the Event, otherwise, the winner will forfeit the prize. * It is the responsibility of the winner and their prize companion to arrange any necessary visas to travel to the US. prize winner and their companion do not arrange for such required visas in sufficient time, they will forfeit the prize. * If, for any reason beyond Boost Juice’s control, the Coachella Event does not proceed on the scheduled dates for Weekend 1, the winner will forefeit the prize and will have no claim against Boost Juice with respect to the cancelled event. Winners may be published prior to contact. winner’s first initial of their first name, full last name and State/Territory of residence will be listed. Prize must be claimed by 12/03/19 at 1:00 pm AEDT. 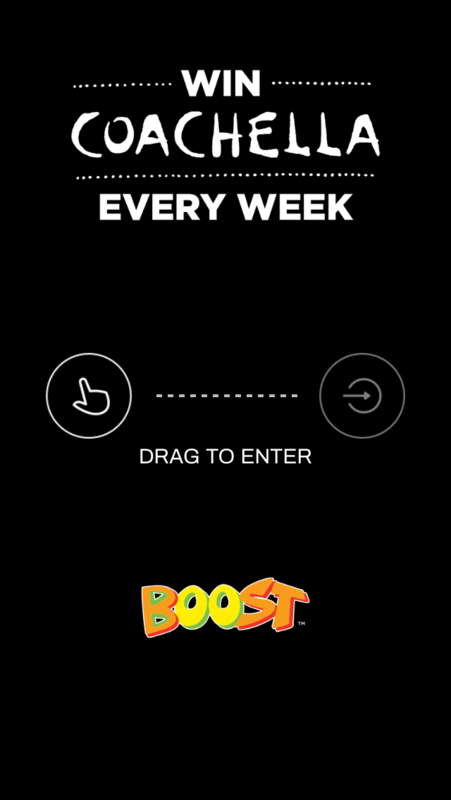 prize, the prize will be redrawn on 13/03/19 at 2:30 pm AEDT at Boost Juice Pty Ltd, Level 1, Tower 2 Chadstone Place, 1341 Dandenong Road, Chadstone VIC 3148, Australia. winners of the redraw will be notified by phone and email within two (2) business days of the redraw. 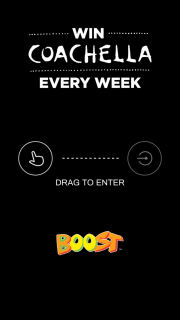 winners will be notified publicly (and their details published) on the Boost Juice Facebook Page (www.facebook.com/boostjuice/) by 21/03/19. prize is won by a person under the age of 18, the prize may be awarded to the winner’s parent or guardian and where applicable to the prize a nominated parent/guardian must accompany any person under 18 years of age. * a) The draws will take place at Boost Juice Pty Ltd, Level 1, Tower 2 Chadstone Place, 1341 Dandenong Road, Chadstone VIC 3148, Australia at 12:00 pm AEDT on 04/02/19, 11/02/19, 18/02/19, 25/02/19 and 04/03/19 by computerised random selection. * i) The Promoter may draw reserve winners in case of ineligible or invalid entries. * ii) The first valid entry drawn in each draw will be the winner of the prize specified in the Schedule above for that draw. * iii) An independent person will scrutinize the draw. * b) If a draw is scheduled on the weekend or a public holiday, the draw will be conducted at the same time and location on the following business day. winner of a drawn prize is determined by chance. 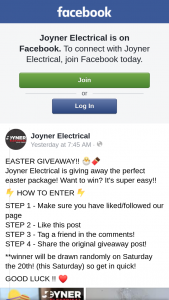 winner by Monday, 11 March 2019 following reasonable attempts, the winner will forfeit their right to the prize. winner chooses not to take their prize (or is unable to), or does not take or claim a prize by the time specified by the Promoter, or is unavailable at the designated time for the Event or at the time stipulated by the Promoter for travel, they forfeit the prize and the Promoter is not obliged to substitute the prize. prizes is accurate and based upon the recommended retail value of the prizes (inclusive of GST) at the date of printing. prizes after that date. prize is exchangeable, redeemable for cash or any other prize or transferable, unless otherwise specified in writing by the Promoter. prize (or portion of a prize) is unavailable the Promoter reserves the right to substitute the prize (or that portion of the prize) to a prize of equal or greater value and/or specification, subject to any written directions of a regulatory authority. prize will be awarded to the person named in the entry and any entry that is made on behalf of an entrant or by a third party will be invalid. winner, the Promoter reserves the right, in its sole discretion, to determine the identity of the entrant or winner. prize suppliers and service providers to assist in conducting this Promotion and to the State and Territory lottery departments as required under the relevant lottery legislation. prize in the Promotion. winner’s first name, initial of their surname and State/Territory or postcode of residence. prize that a winner and their travel companion (or their parent or legal guardian if under the age of 18) may be required to sign a legal release as determined by the Promoter in its absolute discretion, prior to receiving a prize. winner or travel companion is under the age of 18, a nominated parent or legal guardian of the winner or travel companion will be required to sign the legal release on the winner or travel companion’s behalf. prize is provided to the Promoter by a third party, the prize is subject to the terms and conditions of the third party prize supplier and the provision of the prize is the sole responsibility of the third party and not the Promoter. prize at the time it is issued to the winner will prevail over these Conditions of Entry, to the extent of any inconsistency. prize, any delay or failure relating to the prize itself or failure by the third party to meet any of its obligations in these Conditions of Entry or otherwise. 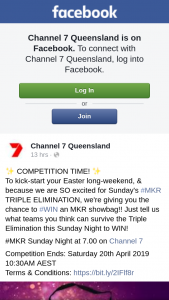 prize, subject to State or Territory regulation. winner cannot provide suitable proof as required by the Promoter to validate their entry, the winner will forfeit the prize in whole and no substitute will be offered. prize (or recommendation), except for any liability which cannot be excluded by law (in which case that liability is limited to the minimum allowable by law). 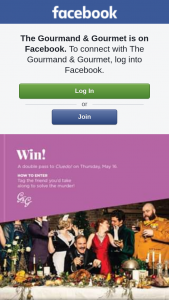 prize is a single event for the winner (and their guest) and cannot be separated into separate events or components.